Studio Scale Models have added two new kits to their range in time for the Christmas season. The first is a CIÉ/Iarnród Éireann Wickham inspection car kit in etched brass. Three of these units were supplied to CIÉ in 1962 and remained in use until the 1990s. The kit is designed to fit a Black Beetle 35mm power unit and includes wheels, transfers, underframe, handrail wire, and acetate for windows and amber lighting. It also features a fully detailed interior, complete with seating and control wheel, and doors can be modelled either opened or shut. Cost: €22 + €3 P&P. Also available now from SSM is this Irish P&T telephone box, also in etched brass, which features interior detail and ‘Telefón’ signage. Cost: €9 + €1 P&P. To order, contact Studio Scale Models directly. The General Motors 141 Class diesel of CIE was introduced in 1962, and for over 40 years has been among the most successful of the Irish diesels. 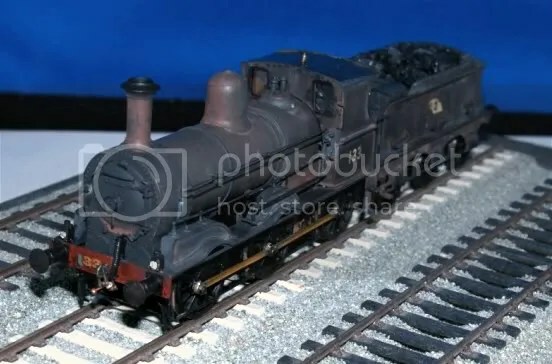 So it was not by accident that Murphy Models chose it for their first foray into a completely designed Irish model (the previous Woolwich Mogul and the NCC Jinty were of course repainted versions of the English models). So, although my main interests are in steam days, and particularly the BCDR, I couldn’t resist purchasing one, with a view to re-wheeling it to 21mm gauge and P4 standards. The prototype is described and drawn in two of the model magazines: by Tim Cramer in Model Railways for March 1977, and by Shane McQuillan in Practical Model Railways for June 1986. The latter article describes also the building of one, from a kit by the Model Irish Railways group. Comparing the Murphy model with the drawings, I could find nothing amiss – except for the buffer spacing. The buffer centres should be at a spacing of 6’3”; on the model they are at 23mm (5’9”). I presume that is to match the spacing of other Murphy-Bachmann models, at English spacing. I first determined that a P4 wheelset would fit between the bogie frames, and it does, just. My main mistake was to dismantle the loco as far as possible – this is not necessary, as the bogie frames can be levered off. 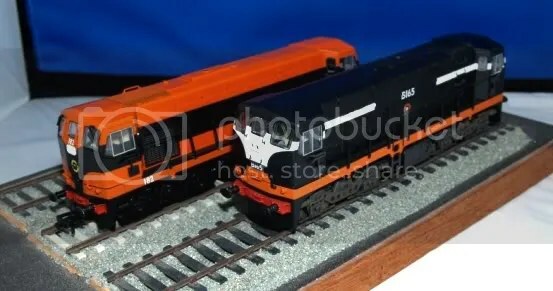 They are similar to those of the Bachmann Class 20 diesel (described by Keith Norgrove at http://www.norgrove.me.uk/index.htm). A screwdriver is used to prise out the frames, which appear to be identical on the two bogies. The wheelsets can then be prised out of the bogies. Each wheelset has an offset plastic gear wheel, two brass bearings which are a push fit in the sideframes, and brass wheels with insulating sleeves. Measure the distance of the gear from the ends of the axles, before tapping out the wheels and sleeves using a small drift and hammer. The gear wheel can similarly be tapped off the axle. 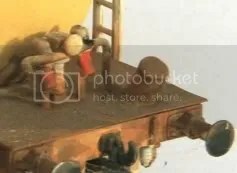 If the model is to be converted to EM gauge, all that is necessary is to cut 2mm steel rod to the appropriate length, and put the gear and wheels on. Although there is a spline on the original axle for the gear, it seems tight enough on a plain rod (a smear of loctite could be used to anchor it firmly). 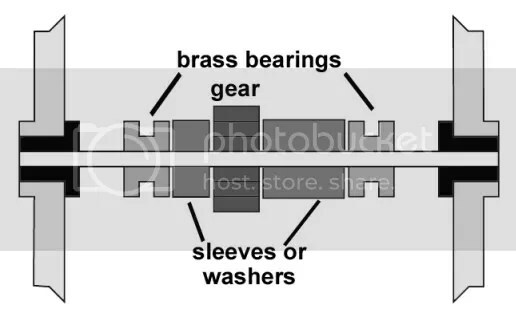 To keep the axle laterally in place, two brass sleeves, or an appropriate number of washers, should be added between the gear and the bearings (or between the bearings and the insulating sleeves (see figure). For conversion to P4 and 21mm, the original brass wheels can be used, but have to be turned down to receive P4 rims (these are obtainable from Alan Gibson on special order). It is also possible to turn down the existing rims to P4 standards. For those without a lathe, it may be possible to purchase P4 wheels to suit. Before finally inserting the wheel sets, the pickups need to be adjusted so that they bear on the backs of the wheels. On the Bachmann wheelsets, the hub projects further out than the rim, and does not fit easily between the sideframes. However, the insides of the frames can be filed out (about 0.5mm or more) to give clearance. I used a cylindrical dental burr to do this, held in a drill press, and hand held the frames. Once finished, the loco ran just as well as it had done on 00 track. Now to try it on Adavoyle Junction, out of period though it be! Several modellers have had a go at fitting sound chips into the Bachmann-Murphy 141 although some seem to be using slightly larger speakers than I did. To replace the unusable round one supplied. I did no filing, just snipped the corners off the oblong speaker’s plastic frame, and soldered the wires from the cut off speaker to the new one. I did not know that there were speaker terminals on the lights board. I have fitted my two, black 141 and 181, with Ultrascale wheels, to 21mm gauge. The wheels are intended for the BR “Western” class, and feature protruding hubs. I removed these using a chisel shaped hobby blade, wider than the tyre diameter. They can then be shaved off, using the outer tyre face as a limit stop, a few minutes work per wheel. I had to reduce the supplied axles length by 0.75mm. The little gear wheel sits on a splined bit of the axle, and slides on the 2mm axle, but a touch of Locktite is all that is needed to secure it. I made the mistake of mounting the gear central on the axle, it should be slightly off set to fully engage the gear in the bogie, I will tweak mine over. The pick up phosphor-bronze strips need bending out to touch the back of the wheels, and act as a side control spring. Now came the big test, would it run? It worked fine on my 3’ length of straight track, but what about my 5’ length, with a reverse curve 4’ 6” into 4’radius, with rail depression in excess of 1mm staggered in the curve: how would the rigid axles cope? Well, much to my pleasant surprise, they stayed on the track, no problem. Since then I decided to file about 0.5mm off the inside of the side-frames, just to provide a little extra clearance, and reduce the chance of the paint on the wheel disc wearing away. Looking at the removed wheels, I think the protruding rim of the tyre could be turned off until the tyre is scale width, and then the flange could be turned down to P4 or EM profile, thus avoiding a twelve week wait and the expense of Ultrascale wheels. flywheel void, thus creating a sound box. It does seem louder, even with the hearing aids turned off. A dab of black acrylic on the silver speaker back makes them all but invisible through the grill. The next job is to fit all the plumbing to the “Pilot”, and try to combine the very neat etched coupling links with Exactoscale bits to form a strong coupling. The supplied ones are extremely neat, but I don’t think the little plastic pins would last long in service. Prior to its gradual demise, the freight section of Irish Rail produced some very distinctive and unique rolling stock that just begs to be scratch built. We have also been blessed that MIR has provided several quality kits in the past few years to recreate them. The cement bubble has been one of these. However, when I decided to build an eleven to twelve unit rake of them over twelve months ago, the euro-exchange rate at the time proved to be something of a disincentive. I also wanted to capture some of the finer detailing that the existing kit as seen from the photo on Steve Johnson’s site didn’t seem to cover. Since having built them, the euro has strengthened significantly and the kit has been superbly revised (what with a very solid new resin casting of the bubble and gangway and ladder brass etchings). Oh well, c’est la vie. I was fortunate in having the opportunity to photograph several of them at the old container sidings in Limerick station which revealed the finer detailing and colouring that would add to building a suitable model. 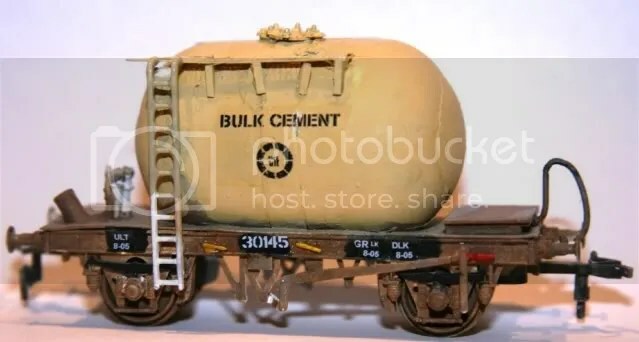 The basis for most 20’ four wheel CIE freight stock is the Dapol C043 cement wagon. The distinctive springs, spring hangers and brake levers are all well captured on this model. Also, because it is a plastic kit, there is much more “depth” to the brake mechanism than one would get with a single piece RTR moulding. The dimensions are a little out, given that the model is a OO/HO hybrid, but this is really of minor importance compared to the abundance of chassis detailing. Finally, there are several parts in the C043 kit that with minor alteration can be used to provide the extra detailing needed for the rest of the model. Two Kinder Eggs – not the hinged type (yes, there are more than one) but the one with the two shells. Guitar string (a light gauge “A” string). A paper lollypop stick (c. 3.6mm diameter). 0.35mm styrene sheeting 30mm x 80mm. Scrap of net curtain material or K & S etched mesh 3/64 diamond. Ratio signal ladder pack (#451). Paint (beige, black, grey, white). First, completely pare back and remove the raised rim on the wagon floor plate (part 6) using a sharp knife or blade. Scribe and then remove the central part between the two holes. I drill out several 6mm holes to make this easier. Chamfer the straight sides of the hole at 45° to make for maximum surface and gluing contact between the bubble/egg and the base. Construct the chassis as detailed in the Dapol instructions, make sure any flash or mould lines are pared and sanded back. The main focus of these is at the buffer sides. Remove the moulded chain from the end hooks prior to fitting as it will impede the coupling bars otherwise. Widen out the wheels on the axles ever so slightly (0.2-0.3mm). Drill two holes on either side of the frames for the levers. The hole left after removing the central section of the plate is too long and will leave a gap at either side when the egg is put in place. You will need to construct a new wagon floor sheet from styrene sheet that the bubble can sit into, see the adjacent diagram for the appropriate dimensions. Remember, fit-check-pare and repeat until a precise fit is got prior to gluing. Then glue down the sheet onto the original chassis top. It will take a bit of time, but once done properly, constructing another ten or fourteen can be done with assembly-line ease. I made a stencil from styrene and used it to draw out and cut the other eleven chassis sheet covers once I was happy with the final dimensions. Identify the plate (part 44). This has raised diagonal detailing that matches the prototype closely. 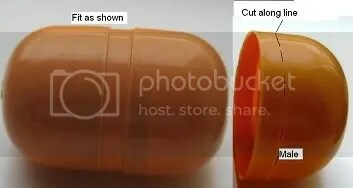 Cut to size by removing paler material as shown in the attached diagram and remove the nodge on the top. Fit at one end of the wagon floor sheet, opposite of where the ladders will be. Construct the cement pipes from chopped up parts 55 and 56. Mark and drill 0.8mm holes in the floor sheet at the other end (opposite to where plate is on) and fit. Bend and then glue some 0.6mm wire to the back. Cut a 5mm length of lollypop stick at a 45° angle using a sharp knife, and mount near the pipes as shown. One of the delights of scratch building this model is that the bog standard Kinder Egg is an almost exact scale replica of the bubble in terms of the hemispherical ends. It does require lengthening and this is done as follows.Take a male section of one egg and carefully cut off the outer 4mm of the rim. This is easy enough to do as the egg wall has a thin channel or groove here to act as a cutting guide. Take the other egg and roughen the ends with sandpaper and then shape a small piece of Milliput so as to round the ends. I recommend dampening the Milliput , applying to the egg end and then shaping it in the palm of your hand. Leave to dry overnight. Fit the second egg ends together as shown and use the cut off piece from the donor egg (!!) to fill out the gap. If the rim piece is cut carefully, it should be a perfect fit. Glue the three pieces together. Note that the plastic used does not take glue very well (even Superglue) so handle carefully. It may be worth trying a more full-bodied epoxy glue though I haven’t done this to date. Glue the egg to the chassis base. Glue some lead window strip underneath to add weight and ballast. Fit the manhole cover (part 51) as the Bubble cap. Bend and glue the guitar wire as vacuum pipe. The gangway can be made from net-curtain mesh (or K&S etched mesh) with a thin rim of styrene sheet . Use double thickness styrene triangles as gangway supports and glue to the side of the bubble. The ladder included in the kit is perfect, but there is only one in each kit! I suggest Ratio signal ladder as an alternative. It is also a little finer in scale. 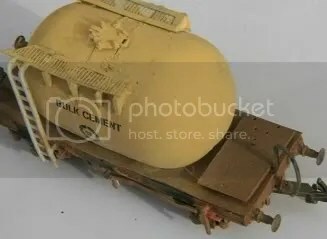 Given that a rake of fifteen will probably remain permanently connected, for added realism I suggest using the coupling provided for the end wagons, and very light gauge wire loop glued to the hooks to connect each of the interim wagons. Painting offers a few challenges as the model has had several liveries, including orange and beige. However for the last decade and more, most of them are an interesting mottled shade of greyish white with algae green streaks. The chassis originally was black but is now usually a non-descript grey-brown. If you are going to be building or repainting any volume of models, I strongly recommend purchasing a good quality air brush, such as an Iwata HP-CS and a mini-compressor. These can be got for quite good value off eBay. The simple reason is you can paint a brace of kits in a matter of minutes using diluted acrylic paint with a smooth, uniform coat that covers even the most inaccessible parts, dries quickly and allows repainting almost immediately. Paint the entire kit in white primer. Spray-paint the chassis and wheels in a lightish grey brown. Spray the bubble beige (mask as necessary). From overhead, use a criss-cross alternating mixture of white and primer grey to get a non-uniform finish approximating to ten years of cement coating. Another option is to spray a thin mist of water and then sprinkle minute amounts of fresh dry Polyfilla powder through a very fine sieve to get the layered cement look. Bend and attach the side levers using 0.6mm wire into the pre-drilled holes, paint white and then yellow. Paint the cement pipes a darker shade of grey/brown. Paint the ends of the brake lever white then red. Paint the sole-bars at appropriate points as indicated in the picture and fit the chassis numbering and inspection stencils. Oh the hours of blood, sweat and tears that can be summarised in little over three pages! However, taking the approach as laid out above and tackling them in an assembly line fashion, you can build a fifteen-unit rake for little over €100 in a matter of days. The main points to re-iterate are: get plenty of pictures to be in that comfort zone about the detail locations and take your time to get the chassis cut out and chassis sheet dimensions and angles correct. You’ll be well rewarded. In a future issue, I’ll tackle how to build the 20’ beet wagon using Corrugated sheeting. Nice! The sub-plot of the article is about what information can be extracted from the Worldwide Web. With the advent of the web and the digital camera many excellent images have suddenly become publicly available representing an unparalleled information source. Of course, lacking access to the prototype, a lot of “reverse engineering” is necessary to guess how things are. A list of websites used is given at the end of this article: if the reader is not yet computer-literate then find an internet café, order a coffee and get started! I started this work in order to gather information for creating a rake of cement bubbles. The only drawing I had was the one which came with an MIR kit, which is quite good. Then I started searching the web for photographs. What became clear quite quickly was that although these wagons may seem to be standard, there are actually subtle differences which reflect the building batches and modifications carried out in service. These details might seem a bit too trivial for most people, but I believe that a little variation adds considerably to the realism of a rake of standard wagons. My notes on this aspect are as below. Solebars: it seems as though these wagons have been built with the stronger springs and spring-hangers of the later four-wheeled stock, presumably reflecting their load capacity of 20 or 21 tons. There are many variations of lifting lugs within the class, which may be two, one or none per side and presumably not necessarily the same number on both sides. Likewise the mounting plate for these lugs may be rectangular, notched or absent and in the latter case various stiffening ribs can be seen instead. 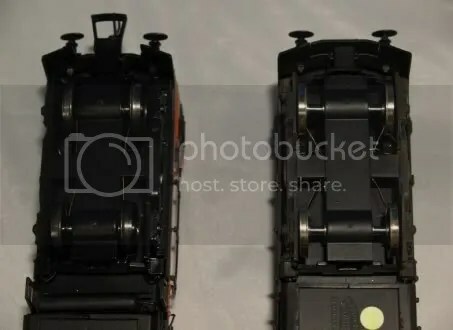 Buffers: two types can be seen on the photographs, both massive parallel items. One (older?) type has a smaller base plate which fits inside the open channel section buffer beam. Note that the buffer beam is arranged with the open channel outwards. The larger buffer is attached to an additional plate welded across the webs of the open channel. Whearas the larger buffer has a relatively plain housing, the smaller one is lumpy with a distal bulge on each side of the housing and a flat rectangle on the top surface next to the ram. Axleguards: most of the axleguards are solid plate items, but some photographs show the earlier fabricated type with a triangular opening on each side of the spring. This can be seen on other wagons of the same era. Axleboxes: on a few photographs heavily bolted wing-plates can be seen on the side of the axleboxes, while most wagons have plain wings. Earlier wagons had a plain dished end-cover whereas most of the photographs on the web show the Timken boxes with the characteristic triangular three-bolt end plate. Unloading Valves: on most photographs, two small yellow-painted handles emerge from holes in the solebar, which control the outlet valves from the tank. Although the little holes seem to be provided on both solebars, the handles appear on only one side. I can see no convention as to which solebar the handles should be on, but there seems to be about equal numbers on left and right-handed examples. Vacuum Cylinder Covers: the cylinders are located at one end of the wagon and protrude slightly above the chassis, necessitating a chequer-plate platform for safe walking over this area. In a large number of examples this plate has been removed, exposing the vacuum cylinders and chassis, which poses an interesting challenge for the modeller. Unloading Pipe: at the opposite end of the wagon from the brake system is the unloading pipework. The main unloading pipe of 6″ diameter emerges from the decking at about 60° and is provided with a loose cover, which may be either cylindrical or rectangular. It is debatable how much variation in these details can be seen in one rake of wagons. New wagons would probably have entered service in very uniform condition but over time modifications would have been made and the various batches would have become mingled. According to advice gleaned from the Irish Railway Modellers web group, the bulk cement wagons have had three liveries so far. Initially they ran in a light-to-mid grey, then were repainted into CIE orange and finally many were given the Irish Cement ivory colour. Of course since the cement is dumped into the top hatch via a loose hose a lot spills over the tank and ditto for the unloading platform. Given some rain this cakes nicely and holds track dust providing a glorious spectrum of very off-white to brown colours, interspersed with patches of virgin white where the cake has flaked off. Many tanks show a haze of light brown over the lower half of the tank suggesting track dirt and/or rust. A competition for the most realistically painted and weathered cement bubble would be in order! We are told we should try to run our model railways realistically, so with that in mind it is worth examining the photographs for operational purposes. I have read various opinions about how many wagons rakes consist of, namely 12 wagons per rake originally later increasing to 20. Photographs of an unloading operation at Adelaide show the wagons arranged in pairs, i.e. with the unloading pipes towards each other. Presumably this is to allow the unloading pipes to be transferred easily from one wagon to the second. However, most photographs show a more irregular order, presumably after some shunting. Despite the apparent complexity, the air unloading system allows unloading the wagon into a lorry-mounted tank, which must be equipped with a suitable air blower. Thus a large unloading installation is unnecessary and cement can be delivered at a simple siding – see the example at Waterside, page 66 in Ulster Transport in Colour by Derek Young. For completeness I should mention my understanding of how the unloading system works, based on the information available for BR’s Presflow wagons. “Fluidised bed” is common in industry to make a heavy mass of powder behave like a fluid by pumping high pressure air through it. The bottom of the cement tank is formed into two cones and it seems most likely that compressed air is injected into each via some sort of distributor ring (I’m guessing here) to fluidise the cement in the bottom of each cone. When the valve on the bottom of a cone is opened, the cement flows out into the large diameter unloading pipe, which emerges up through the decking of the unloading platform and into the unloading hose of the terminal or truck. The instructions for the Presflow state that the pipe-work must be purged with air before opening the cement valves in order to clear any water which has collected in the system, which seems wise. Loading is via the large hatch on top of the tank, most likely by gravity and since this is not a closed system, spilllage occurs. If any reader is able to shed more light on my observations I would be very glad to receive them on merlin-x@online.no.